I have SO been enjoying reading dark and creepy stuff for the RIP Challenge. Since my husband reads a lot of mysteries, thrillers, and suspense, we have a lot of them on our shelves, so this season gives me a chance to "catch up" (I'd actually need a couple of years to really catch up on our TBR shelves!). 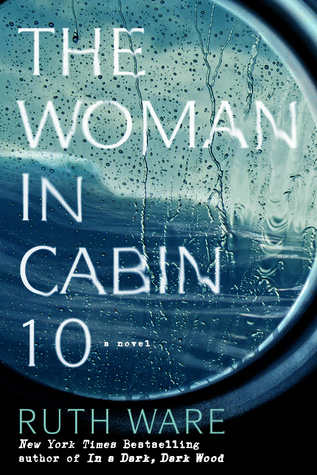 Earlier this month, I excitedly turned to The Woman in Cabin 10 by Ruth Ware, a thriller that my husband gave me as a gift and has been waiting for me to read so that he can read it! We both enjoyed Ware's In a Dark, Dark Wood. The Woman in Cabin 10 is a suspenseful story in a unique setting, on a luxury cruise in the North Sea. Laura "Lo" Blacklock is a struggling journalist working for a travel magazine. As the novel opens, a man breaks into her apartment and robs her in the middle of the night, leaving her with just a minor injury to her face but feeling badly shaken. Her boyfriend, Judah, tries to comfort her after he gets back from a trip, but it is clear Lo is still terrified...and exhausted because she's having trouble sleeping. Nevertheless, she doesn't want to miss the amazing opportunity coming up in a couple of days, to go on the maiden voyage of a very exclusive private luxury cruise to Norway with a handful of other journalists and some wealthy customers. Lo thinks if she does well on this assignment, her editor might choose her to cover for her upcoming maternity leave. So, after several sleepless nights and with nerves still jangling, Lo boards the cruise. She drinks a lot, in an effort to calm her anxiety, and tries to focus on the job and on making important contacts with the other passengers. On her first night, though, she borrows a mascara from the woman in the cabin next door and then hears a commotion in the middle of the night - a scream and a big splash. She calls security, but no one believes her. She is told that cabin 10 is empty (and shown that it is) and everyone seems to think her story is ludicrous, but Lo is convinced she heard a murder. There are a couple of classic mystery tropes woven into this original story. The novel is narrated by Lo, and clearly, she is an unreliable narrator, marred by exhaustion, anxiety, and drinking too much. As readers, we see and hear what she does, so we want to believe her, but no one else does. Also, since there are only twelve passengers and a small crew on the boat, it is something of a locked-room mystery; there are only a small number of potential suspects who would know about the mysterious passenger who disappeared (whom only Lo saw) or the events of that night. Lo embarks on her own investigation, but someone wants her to stop, as anonymous threats to her get more and more frightening. This fast-paced, suspenseful thriller kept me guessing - and reading - and I can't wait to read Ruth Ware's two more recent novels. I read this one in print, but the audio book sounds great - listen to a sample here, from Chapter 1. Or order The Woman in Cabin 10 from Book Depository, with free shipping worldwide. This sounds like a fun fast-paced mystery with a new and different setting. It is! Quite dark & plenty of suspense. I've thought about reading this a few times but always get sidetracked by another book. I completely understand that, Vicki!! This has been on my shelf since Christmas! Sounds absolutely terrific--I rather like unreliable narrators. They usually are very interesting!